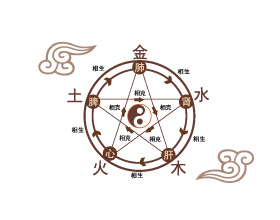 “Traditional Chinese Medicine (TCM) embodies the profound philosophical wisdom and the traditional Chinese health-care concept and practical experience accumulated over thousands of years. Deeply rooted in the profound Chinese culture, Traditional Chinese Medicine is the outstanding representative of global traditional medicine. Qibo is known as the founder of TCM theory, great physician and naturalist in Chinese ancient times. 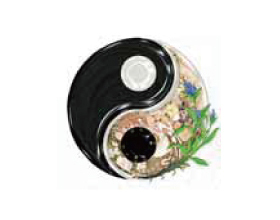 Deeply rooted in the soil of Chinese culture, traditional Chinese medicine embodies the profound philosophic wisdom and the philosophy of health preservation. It is the common wealth of the whole human beings, which not only brings benefits to the Oriental World, but also exerts influence on the whole world. Nowadays, we are frequently faced with issues such as environmental pollution, food safety and excessive medical treatment. Therefore, the construction of ecological civilization has been regarded as the major task closely related to the human health and safety. Under such circumstances, traditional Chinese medicine, which holds the concept of “harmony between human and nature”, values disease prevention, follows the holistic concept and pays attention to temperance, has played an increasingly significance role in the process of marching toward a new era of ecological civilization. To carry forward traditional Chinese medicine culture, and to let our foreign friends feel the glamour of TCM culture, Qihuang TCM Experiencing Center for Foreign Dignitaries of World Cultural Forum (Taihu, China) has been formally approved for establishment under the great support from Ministry of Foreign Affairs and Jiangxi Provincial People’s Government. Many national TCM masters and famous TCM doctors have been invited to provide health care service to the center with the academic support of Guang’anmen Hospital of China Academy of Chinese Medical Sciences, Wangjing Hospital of China Academy of Chinese Medical Sciences, Xiyuan Hospital Affiliated to China Academy of Chinese Medical Sciences, Dongzhimen Hospital Affiliated to Beijing University of Chinese Medicine, Beijing Hospital of Traditional Chinese Medicine Affiliated to Capital Medical University and Lu Zhizheng Institute of Traditional Chinese Medicine. There are altogether four kinds of basic diagnosis methods of TCM, i.e, inspection, listening and smelling examination, inquiry and palpation. Palpation is made up of two parts―taking the pulse and palpating relevant parts of the two parts―taking the pulse and palpating relevant parts of the doctor’s fingers to palpate patient’s pulses, which is the most important part in palpation. To spread the healthy conception of TCM through the dialogue between TCM doctor and foreign guests, such as “correspondence between man and nature”, “Tao follows nature”, “preventive treatment before a disease occurs”, etc. And to fully display the glamour of TCM by carrying out exchanges and discussions on comparison between TCM and western medicine. 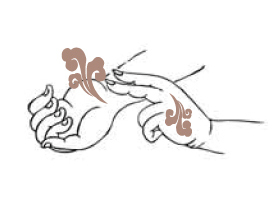 Chinese thermal moxibustion is a new moxibustion technology by using specific moxibustion method to efficiently stimulate propagated sensation along the meridians and achieve “focal arrival of acu-esthesia”, through which meridians can be regulated to treat diseases. Chinese thermal moxibusition is one of acumoxi methods, which is needle-free, with no physical contact and damage, painless and no side-effect. And its clinical efficiency is superior to common clinical acumoxi. Chinese thermal moxibustion has a significant clinical effect on prostatitis, knee osteoarthritis, myofascial pain syndrome (MFPS), cervical spondylosis, periarthritis of shoulder, protrusion of lumbar intervertebral disc, irritable bowel syndrome (IBS), dysmenorrhea, pelvic inflammatory disease (PID), bronchial asthma and stroke. Guided by theory of meridian, Tui Na of TCM places much emphasis on the organic internal relationship between body surface with viscera through meridians and acupoints. 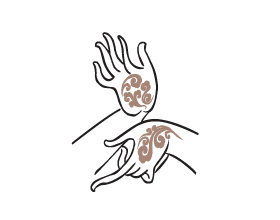 Tui Na of TCM plays a therapeutic role by stimulating and massaging meridians of body surface and acupoints. Tui Na of TCM can harmonize qi and blood, relieve rigidity of muscles and activate collaterals, as well as relieve pain in lumbago, cervical spondylosis, protrusion of lumbar intervertebral disc those which are very common in modern living. China is the country with the earliest origin of pedicure. Theory of meridian believes that feet have close relationship with viscera through meridian system, so the visceral function changes can reflect on the feet. Therefore therapeutic pedicure can enhance immunity and body resistance, which has a role of regulating viscera, promoting blood circulation for removing obstruction in collaterals and keeping health. Baduanjin qigong (Eight-section Brocade), named after brocade, refers to its actions that stretch as beautifully as brocade. 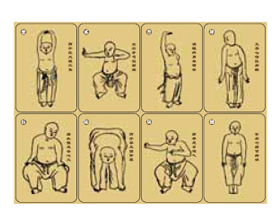 Baduanjin qigong consists of 8 parts, the complete set of actions is smooth and fluent by combination of dynamic and static exercises. As an excellent Chinese traditional martial art for health care, practicing Baduanjin qigong can make qi function flow, correct skeleton and knead muscles. Just in the gate entrance of Jiangzhong medicine valley, stands a giant sculpture, which is 148- meter-long and 9- meter-wide. There are 68 famous doctors of TCM from Shennong in ancient times to Zhangxichun in late Qing Dynasty in the sculpture. Owing to “medicine food homology”, Chinese medicated diets combine traditional Chinese medicine with Chinese food, which have the effect of preventing disease, keeping health and prolonging life. China has the longest history in Chinese medicinal plants cultivation. Currently, there are more than 1,200 types of medicinal materials with an annual output surpassing 350,000 tons, occupying an area of 11 million mu (about 733,000 hectares). Guided by theory of TCM, Chinese medicine processing is a kind of pharmaceutical technology in accordance with the syndrome differentiation, nature of medicine, and different requirements of preparation. It will directly affect the clinical effect whether the processing technology is reasonable and proper. The 50,000 square meters of workrooms that have passed GMP certification in Jiangzhong medicine valley of Jiangzhong Pharmaceutical Group comprise many production lines with the world leading production equipments for the manufacturing of tablet, capsule, granule and liquid. Among these, Shenlingcao production technology is one of the world’s most advanced pharmaceutical technology. The whole Shenlingcao production process is enclosed, monitored and automatic in an unmanned workroom. Shenlingcao production equipment is by far the only one of its kind in Asia. Jiangxi University of Traditional Chinese Medicine was founded in 1959. It is a higher learning institute with TCM as the major subject coordinated with the development of multiple disciplines. The university features a unique integration of industry, learning and scientific research. Covering a total area of 380 acres, the university’s Wanli campus adjoining Jiangzhong medicine valley is the largest and most eco-friendly TCM school in China. In a long-term develop course, a number of famous TCM doctors have emerged in the university. Generations of famous doctors have been working hard on inheriting Xujiang medical school to fully demonstrate diagnostics characteristics of TCM masters, and to collect and enrich the new content of TCM health preservation theory. 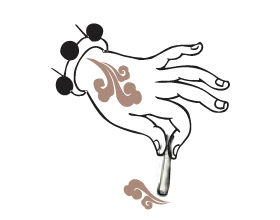 Chinese thermal moxibustion, the original technology innovation―created by the university, has been recognized as the national industry standard and was promoted to the world in the Shanghai World Expo 2010. This new technology has facilitated the establishment of a paradigm that “the best acupuncture is in Tianjin in the north and the best moxibustion is in Jiangxi in the south”. The university has been dedicated to the study of integrative TCM disease-syndrome and the standardization of the diagnostic methods in preponderant illness so as to accentuate the unique effect of syndrome differentiation. Jiangxi province has a rich medical resource, which is world famous for Chinese medicine processing. 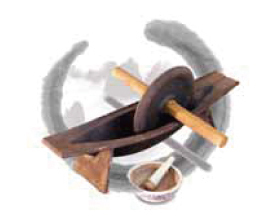 Among the following four major schools of TCM processing technique (Jianchang Bang, Zhangshu Bang, Sichuan Bang and Beijing Bang), Jianchang Bang and Zhangshu Bang native to Jiangxi province take up half of the total. In recent years, the university, through the efforts of enriching scientific content of Jianchang Bang and Zhangshu Bang, has built a traditional TCM processing research system that takes lead in the country. Through the extensive international academic exchange and corporation, the university has built long-term relationship with the scientific research, medical care, educational institutions from more than 20 countries and regions. Since the 1990s, the university has dispatched various medical teams to overseas countries for international medical assistance, and one of them has received “The Highest Knight Medal” awarded by the president of the Republic of Chad. Our university has also fully undertaken the teaching and training of Tunisia international acumoxi training center. The excellent medical skill of our doctors was highly praised by a number of patients including Tunisia president and his wife. By far, the university has trained the hundreds of acupuncturists for Tunisia.